Established in 1943 Holalkere Taluk, Chitradurga Dist. The Editorial Board of this Souvenir has commanded me-a command of love, of course-that I should write to it. Hence this article. I think it necessary to write in detail, the detailed chronological chronicle of this Ashram, before I try to say “WHAT IS WHERE?” The name of this Ashram is “ANATHASEVASHRAMA OF MALLADIHALLI.” This Malladihalli is a small hamlet in some obscure corner of this wide nation. There is proverb in Kannada, which says that even the thread is respected on account of its association with the flowers. This is applicable to this village, which is the thread, known worldwide, by the virtue of its association with the Anathasevashrama. Because the Ashrama was established in this village, the name of the hamlet has been a polestar in the universal heavens. As the name itself indicates, this Ashrama is a fine blending of both temporal and spiritual aspects of life. many paths are recommended to secure the blessings of the Almighty and his realization, in Yoga. Selfless service is one of those paths. The same idea is explained by Sri Krishna in Bhagavdgeetha as Yoga Karmasu Koushalam. This means- ” Do your duties, not allured by selfish motives, without desiring for any temporal benefits and considering your action as the worship of the Almighty.” The summum bonum of the eighteen PURNAS by the great sage Vyasa is told within one sloka Paropakaraya punyaya, papaya parapeedanam. The meaning of this sloka is – It is a fine virtue to help and serve the needy and oppressed, whereas it is a great sin to exploit and torture them. What else it be other than righteousness, to render untainted and selfless service to humanity with an outlook of worship to the Almighty? The adage “Service to humanity is service to God” has the same implication. As already alluded above, Lord Krishna said in Geetha “Yoga Karmasu Koushalam”. what is the need of any skill (Koushalam) for a selfless worker? Yes, herein lies the greatness. Here there are a number of meanings hidden behind the term Koushalam such as, tact, intellect, boldness, fear of God, dislike towards name and fame etc. I am just placing before your one or two examples, to make this point clear. For instance-some institution, some training camp there…A particular person was places in charge of looking to the management of the camp. His wife also joined him in this endeavour. Every chance of exhibiting their power , authority, cunning behavior and deceit during the twenty-one days of the camp was utilized. At last on the Valedictory day of the camp, the person made every arrangement to get the Lion’s share of the prizes and awards in his favor as well as his wife’s and daughter’s, in spite of the protest from all the participants of the camp. Likewise, the same kind of activity is being found in both small and big circumstances in the various associations and institutions at all levels-rural to national. Whether it is private sector or public sector, the dealings everywhere are one and the same. Though there are virtuous persons in these fields, though they are well-educated, they are spoilt by the evil minds everywhere, who shove the people, society and nation as a whole into an unfathomed abyss. Do you want any other living example to this, other than our India? Every Government who have held the reins of the administration after independence have shown the same kind of action. Therefore, let there be a true Koushalam while serving the nation-whether man or woman, whether civilian or rustic. Koushalam means a kind of attitude to crush the selfish motives, and cherish an attitude of selfless service. We should perform all our duties like a sacrifice and we should burn down our brutal selfish motives in that holy fire. Then only we endear ourselves to the Almighty. Unless the heart will be pure and sweet -unto that of child, Doth not thou dream of the vision of thy Father. Hence, though Karmayoga appears to be very common to say and hear, its practical side needs greater skill. Though we are performing our duty, we should not get ourselves involved in it, like the lotus leaf in the water. Our preceptor used to say: ” Look here, selfishness is a gum, stuck to our fingers (mind). This gum sticks firmly, in spite of our dislike towards it. A high degree of skill is needed to disentangle ourselves from this gum”. Should we discontinue our selfless service because it is very difficult to disentangle? Who can say about the heaven and hell of our future? Sage Thulasidas said that service to the poor and the oppressed, the ailing and the orphans should be done. Considering their pains and sufferings to be ours, during our short life time, and this would be the way to God realization. An ordinary person would have said-“What shall I do with heaven and hell? Let us enjoy this life till I live”.- A fool of this caliber is found in millions, in this country. But how many selfless workers can be found? The names of Rantideva and Divodasa, king of Kasi are immortal in the great story of Mahabharata-similarly, the name of St. Adam in Christian literature is eternal. Rantideva had lost everything and was suffering from hunger and thirst; but God presented Himself before rantideva and asked him about his requirements. He replied: Natwaham Kamaye Rajyam, Na Swargam, Na Punarbhavam; Kamaye Dukhathapthanam Praninam arthinashanam. “O God, I do not want to get back my lost Kingdom. I do not want even Heaven, I do not want another birth also. If you want to grace me, kindly allow me a chance to eradicate the pains of the poor who are suffering”. This is the height of selfless service found in Ranti deva -an ideal personality. Please don’t think that I am deviating from the fact as to what is there in the Ashram. If you drag the hand, the entire body follows-similarly if I tell something about the Ashram, something related to myself as its background should be dealt with-there is no wonder in this fact. Therefore I shall briefly touch a few facts about me and then explain about the Ashram. An obscure corner in Kerala happens to be my birth place. I was the only ailing child to my parents. I t is said that I was not conscious till the age of fifteen. My mother was bringing me up as an invalid in a cradle. ( Such lean and invalid children are brought to our Ashram now for treatment). My original name is Kumara Swamy. Anantha Padmanabha Namboodiri was my father, who was suffering from consumption on account of her only ailing son. The inhabitants of Kerala are usually the devotees of Sri Mookambika of Kollur. Thus my mother persuaded her husband to have a pilgrimage to Kollur with her ailing son. They travelled on foot, walking one or two miles every day and halting on the way for rest. No amenities for travelling were available in those days. Thus having travelled for a very long duration, this family reached Barkur, a village in Dakshina Kannada District and stayed in an outhouse of some building. Forced by circumstances, they had to stay there alone for a longer duration. My father became very popular both in Barkur and in the surrounding villages, on account of his skill and knowledge in astrology. Ramachandra Shastry was another astrologer who dwelt in Bhirthi, a nearby village. He heard of the advent of Anantha Padmanabha Namboodiri from Kerala, and visited him in Barkur. The very first meeting of these two scholars brought them very close and Ramachandra Shastry often visited Namboodiri to discuss about Astrology; he used to stay with Namboodiri for one or two days. Now, the owner of the house was one Narasihmaih who had given shelter to Namboodiri. Narasihmaih and his wife Puthali Bai had a great regard for Ramachandra Sastry. Now, one Swamiji of Mantralay’s Rahgavendra Swamy Mutt had put up at Bhanarkeri Mutt, which was very near to Barkur. Mantralay Peeth is respected by everyone even to-day. Hence, a host of devotees heard about the arrival of Mantralay Swamiji and rushed towards Bhandarkeri Mutt. My mother Padmambal also went there with her ailing son. After the usual ceremonials, the devotees received Prasadam and went away. But, my mother was still sitting there. Grasping her intention, the Secretary of the Sri Mutt approcached the Swamiji and told that the wife of the famous astrologer of Kerala awaited the Darshan of Swamiji. The Swamiji himself came out and enquired her as to what the matter was. My mother explained to him all about her only son, with a pathetic tone. The Swamiji assured her that she need not worry herself for the boy, who had every chance of being a very famous person in the days to come. Thus the Swamiji blessed her and her son with holy “Phala-Mantrakshata”. The mother was extremely happy and she returned to Barkur with her son, with quick steps. She was highly pleased with the assurance of the Swamijji that her son would be famous. The very words of the Swamiji blessings had filled every drop of her blood with new enthusiasm and fresh life. Is there any decrepitude to a mother’s love? It is always juvenile. My mother hurried back to Barkur, enchanting the very words of the Swamiji all along her way and instantly reported the same to her husband, in all eagerness. He too felt glad. But recognizing the uncontrolled bliss in his wife, he solaced her and advised her to take rest a while. There is a traditional saying -Too much of joy leads to sorrow. The same thing happened in my mother’s case. She passed away within a week after the above incident. This incident affected my father’s heart very gravely. Of course, he did not feel sad at his wife’s death. He had well understood the eternity of birth and death. He only felt worried about the upbringing of his only invalid son. At last, he implored the house-wife Puthali Bai to look after his invalid son. He also requested her husband and owner of the house-wife Puthali Bai to look after his invalid son. He also requested her husband and owner of the house, Narasihmaih. But there was no acquiescence from them. By chance, Ramachandra Sastry of Bhirthi heard about the death of Namoodiri’s wife and hurried to console him. Namboodiri was hopeful when he saw Ramachandra Sastry. He begged Sastry to persuade Puthali Bai to bring up his only son. Sastry, in turn appeased Namboodiri, and employing all his skill in persuading Puthali Bai, brought about an adoption in favour of me, to puthali Bai and Narasihmaih. Thus the first chapter in my life seemed to have ended. The very next day, Namboodiri handed all his earnings by way of astrology, to Puthali Bai and went on a pilgrimage to North India. From that day onwards, I was brought up as a son to Puthali Bai and Narasihmaih. I never remembered any of the past events of my life. Not only this; everybody considered me a native of Barkur, as I was brought up there alone. 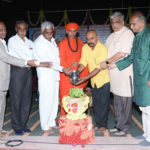 I was rechristened as Veera Raghavendra on the day of my adoption to Puthali Bai, in view of the fact that I was bestowed as a gift from Raghavendra Swamiji of Mantralay. I do not know the why and wherefore of Yoga, but from that very day my abilities both physical and mental began to develop. I started my education in an indigenous private school. Later, I got admitted into the Higher Elementary School in Barkur. I never lagged behind in my studies. I secured first class marks in all the other subjects except English in which I secured marks for a just pass. Even to-day, I very well remember; I was highly antipathy towards English since my young age. I never gave any attention to that subject. But, I had a great affection towards music from my childhood itself .I was educated in Karnataka Music till Varna and Kirtan. I Used to sing melodiously devotional songs. I could sing the songs of Bhajan (Group devotional songs). I participated in many dramas enacted during the School Anniversary Celebrations. 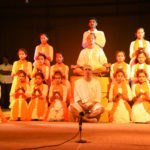 In some particular Year- the drama was CHANDRAHASA- I took a role in the drama and when I entered the stage, there was a loud applause and clapping from the audience. There was some song from me; the audience would shout “once more” and I never had to disappear without singing the song, at least three to four times. My special hobby was Yakshagana Bayalata and Thala Maddale. Not only in my place, but anywhere within the radius of two or three miles from Barkur, if there was any Yakshagana performance, I would be present there well in advance before the “Chowki Pooja” (a kind of green room for the artists). Thus I remembered by heart many a “Prasanga” (The text of the play). The very next day I would begin dancing Yakshagana, in the yard in front of my house. After completing the Higher Primary Examination in Barkur, I was admitted to the High School at Coondapur. I did not lag behind in my studies, there too. But, I would secure just marks in English, which I disliked very much. I was very mischievous then, but my mind bent upon literature by the influence of Shivaramaiah who was my Kannada Pandith. Since then, I would listen to the lessons in the class with concentration and spend the rest of my time in the study of literature. I opted for Sanskrit in my high school studies, and it helped me a lot in the improvement of Kannada. While studying at Coondapur, there was an incident which brought about a metamorphosis in my life. I had returned from school, one Saturday to Barkur. On the very same day, I was acquainted to Sri Nityanand Swamiji who blessed me with Tarakayoga (Shaktipatha Yoga). After this rare incident , my life entirely bent upon spiritualism. From that day onwards, an inner urge developed in me to have the vision of God and to be one with God and to have the rare experience of Samadhi. I sat meditating in lonely places like forest, hillock and the ruins of old temples. But I would be greatly worried when I neither had the vision of God, nor could get Samadhi.